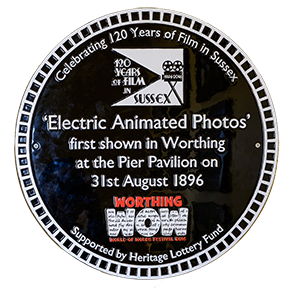 Plaque unveiling and '1896 Recreation Night' presented as the launch of the Worthing WOW festival. Celebrating 120 Years of Film in Sussex. Welcome to our new online archive of this special project funded by the Heritage Lottery Fund. The first film screening in Worthing took place on the pier in 1896. 120 years later we celebrated local film history with a series of exciting exhibitions, educational workshops and events between March-June 2016. This was timed to culminate in the Worthing WOW festival 28th May -12th June 2016. On the EXHIBITIONS page you will find images and information about our two exhibitions. A summary of all the festival EVENTS and WORKSHOPS can be found. “Electric Pictures”, by Ellen Cheshire and James Clarke, which will be available to purchase from March 2017. See the THANKS page for the many people and organisations we have to thank for making the event a success. Download our free APP to experience a walking audio tour of Worthing's rich cinematic history. Worthing is waiting for you to visit. Come and explore the history of our wonderful town. See the VISIT page for information about the cinema heritage you can trace in Shoreham and Worthing.